Mike Trout has been baseball’s best and most dominant player since 2012, so a little earlier this year, when he encountered something of a slump, it was a newsworthy event. Trout seemed almost perfect in all things, so it raised more than a few eyebrows when he started striking out fairly often. Before Trout, there was no Trout, but between 2009 – 2011, no one accumulated more WAR than Evan Longoria. He was perhaps baseball’s best young player, and it’s not like he fell off a cliff after that; Trout was just better. But Longoria was an awesome young superstar, and he, too, seemed impervious to trouble. It would’ve been hard to imagine Longoria going through hard times. Yet here we are now, and Longoria’s hit some hard times. Fortunately or unfortunately for him, it’s been partially masked by the whole Rays team dropping out of the race, and it’s not like Longoria’s been bad, but something’s been missing, something of great importance. He’s still just 28, so it’s probably too soon to talk about a decline, but to this point Longoria’s been without his greatest strength. And it’s a mystery as to why that is. The defense is still there. Longoria’s always been awesome on defense. He’s not having unusual trouble making contact. He’s not chasing unusually often out of the zone. 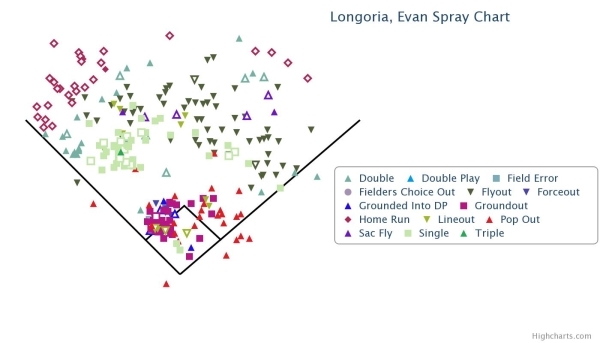 In terms of his skillset, Longoria doesn’t seem like a different player, but now check out some heat maps. On the left, we’ve got Longoria, from 2011 – 2013. On the right, we’ve got Longoria, this year. These are run-value heat maps by pitch location, where positive numbers are good and negative numbers are bad. I don’t need to call your attention to anything; your attention will be called. All the samples, of course, are limited. We’ll never be able to get around that. But look at pitches inside. Used to be, Longoria punished those pitches. This year, he’s not just punishing them less — he’s not punishing them one bit. 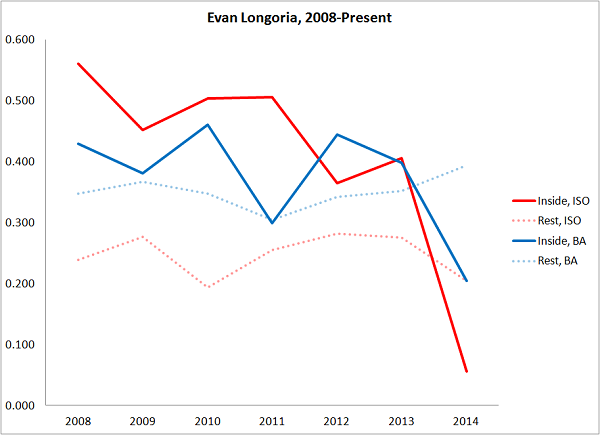 Against inside pitches, Evan Longoria in 2014 has been a disaster. Let’s deal with all of Longoria’s batted balls, broken down by pitch location. In one category, we’ll look at pitches over the inner third, or beyond. In the other category, we’ll look at the remaining pitches. Basically, let’s split Longoria’s batted balls by inside pitches and non-inside pitches. The following graph will include both batted-ball batting average and batted-ball isolated slugging. This graph, to me, is an absolute shock. This year, Longoria’s performance against inside pitches has plummeted. His batting average has tanked, and his power has also tanked. Against all the other pitches, Longoria has been more or less fine — his power’s been down a bit, but his average has been up a bit. Always, Evan Longoria has controlled the inner third. This season, Longoria’s greatest strength has been his greatest weakness. Among right-handed batters, between 2011 – 2013, Longoria ranked 19th in batting average on inside pitches, at .378. Last season, he ranked 23rd. This season, he’s second-worst. He’s batted .204 on inside pitches, against last year’s .398. And, among right-handed batters, between 2011 – 2013, Longoria ranked fourth in isolated slugging on inside pitches, at .428. Last season, he ranked seventh. This season, he’s second-worst. He’s at .056, against last year’s .406. Put another way, a year ago, Longoria’s slugging percentage on inside pitches was north of .800. This year he’s shy of .260, on more than 50 balls in play. Before, Longoria was extremely consistent. Of all the balls he hit fair on inside pitches, he hit about 30% of them in the air toward left. That’s where power would come from. This season, that rate has been halved, and here’s some visual help, from Baseball Savant. First, Longoria against inside pitches from 2011 – 2013. Then, Longoria against inside pitches in 2014. There’s just nothing to left, and nothing to left-center. It would be one thing if Longoria had always been like this, but he’s actually been the opposite. These are the pitches Longoria should’ve been driving. He’s driven almost none of them, in particular to the pull side, and it’s curious. It makes you wonder about his mechanics, his approach, and his health. There’s nothing that’s immediately apparent, but the numbers themselves all but beg for further investigation. You start with the data, and you look for an explanation, until you’re satisfied that an explanation exists, even if you have to settle on bad luck. For some reason, Longoria hasn’t been turning on pitches in, and that used to be something he did better than almost anyone else. I’ll say this — that one home run came a week ago, against 93 mile-per-hour heat. Longoria yanked it on a line, and then on Tuesday, Longoria pulled another inside pitch for a liner, this time one that found a glove. These could be signs that Longoria is getting things straightened out. You’d expect him to do that, if there isn’t anything deeply wrong; with a guy that young and that good, it takes a lot of evidence to believe a strength has become a vulnerability. Our assumptions should always start with, good young players remain good young players. So it could just be an ugly-looking slump, a slump that happens to be ending. In which case, nothing to really worry about. But the numbers are still striking, and so Longoria isn’t out of the woods. He needs to punish those inside pitches consistently, again, or else he’s not going to be the same player. And the Rays are really fond of the awesome version of Evan Longoria. If this is the start of something, it’s hard to imagine how Longoria could turn out better for it. When one strength disappears, it’s tough to find a new one. We hoped you liked reading Evan Longoria is Missing the Best Part of His Game by Jeff Sullivan! Has he been doing something like Matt Adams trying to avoid any shift? 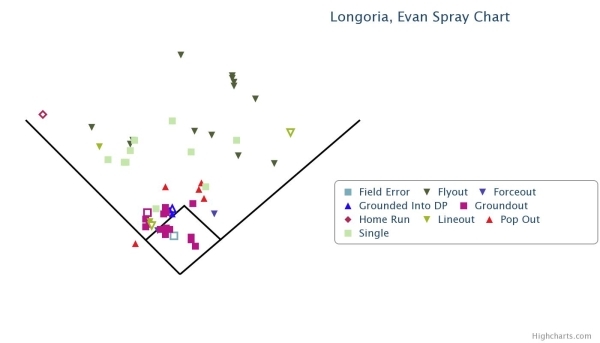 Haven’t seen the Rays much this year, but if Longoria’s trying to inside-out the inside pitches he’s correcting something that doesn’t appear to need correcting, based upon that pre-2014 spray chart.